Apple Cider Vinegar has a lot of health benefits and has tremendous uses in everyday life like cures stomach issues, cures hiccups, good for skin Etc. Though drinking ACV is good for most of the people, it does have some negative effects on health. Are you surprised??? Yes. 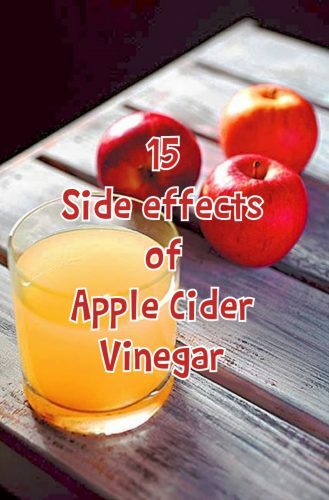 The side effects of apple cider vinegar is caused only when large amount of apple cider vinegar is consumed. The happy news is, the side effects of Apple cider is less compared to its benefits and when ACV is taken in the correct proportion and when followed the correct procedure of taking ACV then we can avoid the side effects of apple cider vinegar to an extent. Knowing all the goodness and the health benefits of apple cider vinegar people tend to drink more to get the results soon. But keep in mind taking the glass of ACV everyday can do more harm than good. In this article we just listed on the side effects of apple cider vinegar. Drinking more apple cider vinegar without diluting and consuming for an extended period of time might cause bone density loss. If you have symptoms of osteoporosis or brittle bone diseases, never ever take the apple cider vinegar without consulting your doctor. Also check the signs of calcium deficiency. Apple cider vinegar causes an unhealthy decrease in the potassium levels if taken in excess. The low potassium level in your body causes irregular heartbeat, low blood pressure and muscle weakness. Check the top 10 potassium rich foods. People with the symptoms of type 1 diabetics should not consume apple cider vinegar. It might cause heartburn, bloating and nausea. It reduces the amount of time taken for the food to leave the stomach which in other words affects the blood sugar level and insulin levels. Check what the pregnant moms need to know about gestational diabetes. Apple cider vinegar causes in proper working of digestive system in some people. Since the apple cider vinegar contains the acetic acid it decreases the appetite and promotes the feeling of fullness for long time and thus reduces the calorie intake in body. This might cause the health issues for some people and increases the acidity. Check the top 10 reasons for obesity. Though the apple cider vinegar helps to whiten their teeth Studies show that acetic acid in vinegar damages the tooth enamel. If apple cider vinegar is gargled every morning to whiten the teeth or to remove the bad breathe without diluting it with water, the tooth enamel is decayed and the minerals are lost. So it is always advised to use diluted ACV when gargling your mouth. Check how chocolates affect your teeth. Since apple cider vinegar is very acidic in nature, it sometimes cause esophageal Burns (throat burns). A report shows that it coauses throat burns in children when they swallowed the vinegar and researches recommended apple cider vinegar should be kept in a child proof containers. Another case has been reported that and Lady Who Swallowed ACV tablets got struck in her throat and gave throat burns. ACV is strongly acidic in nature and it might cause skin irritation and skin burns when applied on the sensitive skins. A report shows that a 14 year old girl got skin burns when she applied apple cider vinegar continuously on her moles. So it is advised not to use apple cider vinegar on your skin, if you have a very sensitive skin. Also check the 7 essential skin care tips for women. The acidic nature of apple cider vinegar and easily reactivate some drugs like laxatives, Diuretics and insulin. ACV can directly affect the insulin levels and the blood sugar levels and is very hazardous when taken with the blood pressure and diabetic medications. Apple cider vinegar when overused it leads to painful headaches and migraines. This occurs due to the detoxification property that makes our brain release harmful toxins. Check here how to cure migraine using Himalayan salt. If you are first time user of consuming ACV you might feel some nausea for the first time. It is due to the sensitive stomach that reacts to the apple cider vinegar. So avoid taking undiluted ACV in morning with empty stomach. Check thehome remedies to cure vomiting. Detoxification of body means getting rid of both good and bad substances from your body. If you are using apple cider vinegar for this purpose of detoxification make sure to keep the mineral levels up by taking the supplements like multivitamins and minerals. Check here for the essential vitamins and supplements your body needs. If you’re developing stomach ache after consuming apple cider vinegar immediately then it might be a sign of gas. In order to avoid this gas problem mix the ACV with water and baking soda. Mix 2 tablespoon of apple cider vinegar along with the one teaspoon of baking soda in 8 oz of water and by drinking this you can eliminate the stomach upset. Check the home remedies to cure the acidity. The sugars in the ACV can actually stimulate peristalsis. Check the causes of constipation in children. If you’re getting severe itching after consuming apple cider vinegar then stop using it until you are certain that ACV is not the reason for your itching. In order to test this again take ACV and if your itching returns then stop consuming ACV because it means you’re allergic to the ACV. Since happens to go to when you get here can help your body to release the toxins it will force you to use the bathroom more often. So consuming more apple cider vinegar and on daily basis makes your kidney to work more and sometimes destroy your kidneys also. So try to consume in the proper proportion and proper quantity. Check the foods that causes kidney stones. Since ACV is very acidic in nature limit your intake of ACV. Always start with a smaller amount of ACV and increase to maximum level of two tablespoons that is 30ml per day. It also depends on the tolerance level of each individual. Apple cider vinegar is highly acidic in nature and it is always better to dilute it with another liquid like water juice Etc before drinking it. Mix 2 to 3 teaspoons of apple cider vinegar glass of water and then drink it. Always rinse your mouth nicely with water after taking the ACV to minimize the side effects of Apple Cider Vinegar. Try to avoid the exposure of apple cider vinegar with your teeth. You can either mix 1 tablespoon of ACV with a cup of water and drink or gargle it or you can use a straw to drink the ACV without exposing to your teeth. Avoid drinking apple cider vinegar if you have gastroparesis. Avoid using apple cider vinegar on your skin if you have very sensitive skin. Always go for skin patch test for 3 to 4 days continuously and check if you have any irritation or skin burns using this ACV. 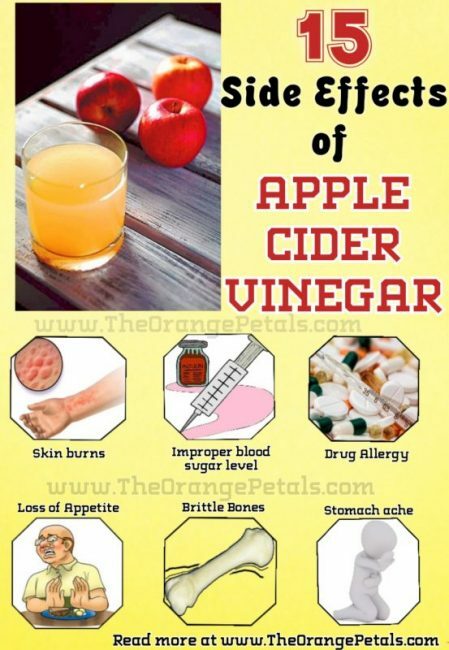 If you have irritation then stop using apple cider vinegar ACV is not your cup of tea. Check for any allergies while taking apple cider vinegar if you feel any allergic reaction like getting diarrhea, skin irritation, vomiting sensation Etc then stop taking ACV immediately. But this allergic reaction of ACV is very rare to occur. If you’re taking any medications and want to consume apple cider vinegar then it is always advised to consult your doctor before consuming it. Answer – Organic apple cider vinegar is always the best. Try to buy organic and unpasteurized apple cider vinegar because it contains all the good microorganisms that is good for your health. If you’re not sure how to identify the correct one just go for the Bragg’s Apple Cider Vinegar with mother. You can see her stranded type sediment at the bottom of the jar which is called has the mother. Question – Can I mix apple cider vinegar with any juice or beverages. Answer – If you want to consume with any beverages Just Go With water and honey. Avoid Mixing ACV to any carbonated drinks. Answer – You can take one to 2 tbsp of apple cider vinegar diluted with water not exceeding 30 ml of undiluted apple cider vinegar as consuming more ACV creates more problem. This recommended intake still varies from each individual. People under medication should avoid consuming apple cider vinegar. If they want to consume ACV then consult the doctor and take the recommended dosage. Pregnant ladies and lactating mothers are generally advised not to take ACV. People who got immediate allergy after taking ACV should avoid consuming ACV. Apple cider vinegar is always very good for health and it’s uses are tremendous in day to day life. Though the side effects of apple cider vinegar occurs rarely it is always advised to consume ACV diluted with water or any juice and be careful while taking it. Keep in mind anything in excess is always dangerous to health.